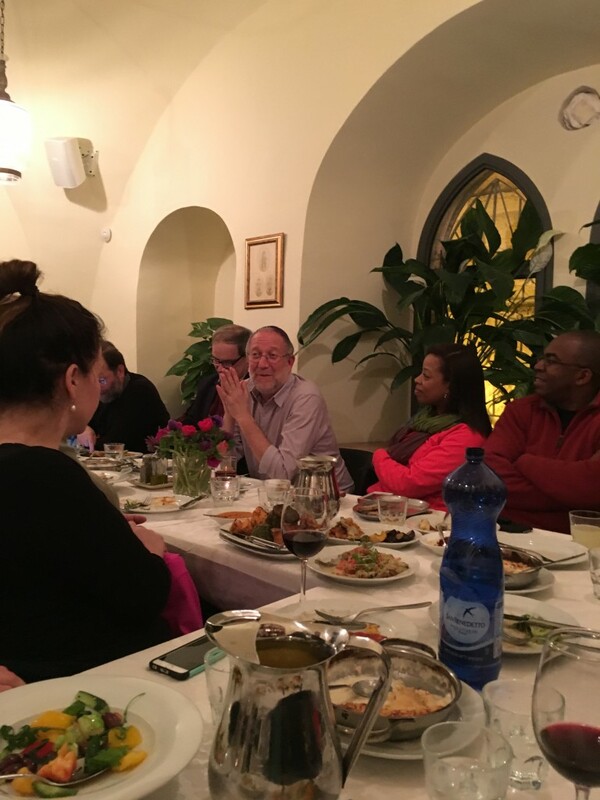 When I was in Jerusalem, I had the opportunity to listen to Yossi Klein Halevi, senior fellow at the Shalom Hartman Institute (Israel’s equivalent of the Brookings Institution) give a hour-long dinner talk about the state of affairs in Israel today. Yossi did a remarkable job providing an overview of the development of issues today by putting them into the context of the political developments of the last 30 years. Many of the things he said appeared this Saturday in a compelling essay in the Wall Street Journal. I found that interesting, as in many ways I thought there was a disconnect between the culture I was experiencing, traveling throughout Israel, and the elephant in the room — the low level terror wave that has continued without stop for even a week, in the past five months. I remember walking down Jaffa Street at night thinking this, or sitting at an outdoor café in Tel Aviv, and thinking, there is this rich culture here, and this strange sense of normality, yet, at any time, really bad things can happen. Now, to be fair, one can say that about my favorite American city Chicago, too. Chicago is experiencing a terrible homicide wave right now. But it doesn’t stop people from continuing with their lives. The difference, however, is that the murders in Chicago are contained to specific neighborhoods, and in Israel it is far more complex. Yossi continued by arguing that “we are experts in containing a pretense of a daily life. And it gets us through a situation in which we have been, in one way or another, at war, since the day this country was created. Three months after the Egypt peace treaty, we were at war in Lebanon. We shift from border to border from conflict to conflict.” But he thought there was a deeper reason, for the unwillingness to address it today. “as a society, we have exhausted our political options.” To explain this, he provided us with a succinct, yet extremely persuasive overview of the evolution of Israeli politics since the 1980s. What follows is my summary of what his lesson in Israeli political history. All errors are my own. we find ourself in possession of the biblical heartland of the Jewish people, the heart of our story. These lands,are very small. Greater Israel is the size of New Jersey. Without Judea and Samaria, its the size of Rhode Island. We are really looking at a territory that is geographically intimate, unbearably intimate, in which Israel has profound religious, historical, and security interests. So in the 1980s it seemed like a fairly inevitable idea, that this is what we were going to do. No country in our place would have given up this territory, To this day I am convinced of it. Given the threats we face, and the lands we won in a war we didn’t seek, I don’t believe any country in our place would have done any differently. Things change with the coming of the First intifada which began in Gaza in 1987 and spread to the West Bank. (Intifada actually means “uprising” in Arabic). An uprising in which people threw rocks and molotov cocktails. Israel had control over the entirety of the territories at that time, so the violence was limited in that sense. The 1990s was also the time when Israel learned a painful lesson that remains to this day. The Israelis sought peace, but they had been tricked by Arafat. Arafat and Rabin together came to sign the Oslo Peace Accords, which paved the way for the Palestinian authority, and the first step towards a two state solution. But Arafat had played a trick. “He spoke peace when he went on CNN, but spoke jihad to his own people, when he spoke in Arabic… and no one was listening. it became clear to me that it was a one way peace process, in which Israel would give up territory, it did not get peace in return. Instead we experienced more terrorism than at any time in our history. The second intifada effectively ended the era of the “guilty Israeli.” Sympathy for Palestinians and their plight largely went away, and was relegated to the pages of the leftist newspaper Haaretz. Israeli guilt over the occupation was wiped away by 4 years of terrorism. What we learned in the second intifada, is that no amount of Israeli concessions, except for Israeli agreement to commit suicide by opening the border to allow hundreds of thousands if not several millions of refugees from 1948 into the Jewish state, which would mean we would lose the one place on the planet where the Jewish people is a majority which is the goal of the Palestinian national movement. The price for peace is my agreement to commit suicide. Yet, exhausted by the second intifada, the closing act of the “Peace now” period was Prime Minister Ariel Sharon’s decision in 2005, to unilaterally withdraw from Gaza, pulling out of the settlements there, and setting it loose. The 2000s had become the decade of unilateral disengagement. The end result of that was a complete disaster, with rockets raining down on Southern Israel and Hamas seizing control of the Gaza strip. After the 2006 Palestinian elections, Hamas soundly defeated the Fatah (the political party of the P.L.O.) and gained control of Gaza. Hamas is designated as a U.S. State Department designated terrorist organization, and its very charter is dedicated to the destruction of Israel. The unilateral withdrawal from Gaza left a sour taste in the mouth of most Israelis, and led to the periodic cycle of violence and conflicts between Gaza and Israel, the most recent of which was the 2014 summer war. Each cycle has made the two state solution of the Oslo accords harder and hard to accomplish, and has pushed many Israelis to simply accept the status quo, in spite of desperately wanting to see a close to a 50 year period of occupation end. And in many ways, it enabled the right-wing Likud coalition under Bibi Netanyahu to govern for the past eight years, and propelled by the far right, to continue expansion of settlements in the West Bank. An indefinite occupation would make Israel more and more of a ‘pariah’ and we would find ourselves in more and more complicated and often unbearable moral dilemmas as occupiers, and find ourselves increasingly alone.” BUT If Israel were to disengage from the West Bank, the assumption is that in a month, or year, or five years, it would not be Mahmoud Abbas in charge, it would be Hamas… The second threat is we will create a Palestinian state, but the rockets will fall on Tel Aviv and Ben Gurion. Just as when we withdrew from Gaza in 2005. For me a Palestinian state is an existential threat if it doesn’t happen, and it is an existential threat if it does happen. And now the status quo itself is becoming untenable, with stabbing and terrorist attacks continuing for five months, and more and more questions being raised about the stability of Palestinian President Mahmoud Abbas’ Fatah government, and the future of the Palestinian Authority itself. Add to that, much greater threats in the region, with ISIS in the Sinai and hovering near the Golan Heights in Syria, and Hezbollah in Lebanon. The fact that the status quo is becoming untenable, is forcing the issue, making this a very important time. If the 1980s were the period of Greater Israel, the90s represented Peace Now, and the 2000s focused on unilateral disengagement, it is unclear what this decade, will ultimately be described by. Time will tell. Yossi’s Wall Street Journal article suggests that the problem of ISIS and Iran have the potential to bring together a gulf state alignment, but that does not provide an answer to the conflict. Other Israelis, like Zionist Union and Labor leader Isaac Herzog are arguing for total separation from the Palestinians, as an emergency measure. My own take (not necessarily Yossi’s) is that efforts at democratization and ways to build a more robust economy in Palestine are the most important thing that can be done. Economic prosperity can help support a Democratic Palestine. The current Arab world offers few models for that, but the Israeli democracy could.